Prayer wheels are large Buddhist constructions often found at temples that consist of a cylindrical wheel that has been placed upon a spindle so that it can easily be spun around. 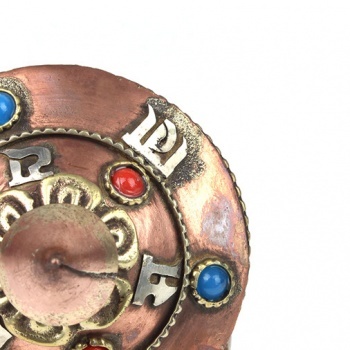 Inside the wheel is a scroll onto which mantras, usually Om Mani Padme Hum, have been written hundreds, thousands or in the case of very large wheels, millions of times. 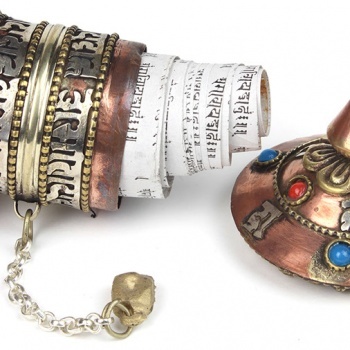 According to the Buddhist tradition, the temple visitors and monks rotating these prayer wheels will gain much the same meritous effect as reciting the mantras orally. 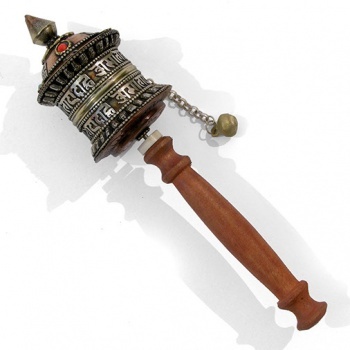 These wonderful smaller versions are often called Mani wheels (or mani-chos-'khor in Tibetan.) Working on the same meritous principles as the larger, temple style; they are designed to be portable, practical and beautiful.